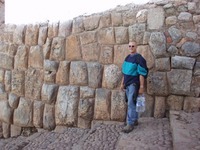 Land price includes ground transportation per the itinerary beginning in Cusco, 8 nights accommodations (based on double occupancy), 8 meals, all group sightseeing per the itinerary (the Inca ruins of Sacsayhuaman, Ollantaytambo, 1 day Machu Picchu entrance and local English-speaking guides). Group tips & gratuities are included for local guides, drivers, and other group activities; however we suggest individual tipping if someone offers you special service. Land price does not include international or domestic airfare. International air price starts around $900. Internal Peru domestic airfare (Lima to Cusco roundtrip) starts at $350. Current airport departure tax for Cusco is $6.50 and Lima, $32.00. All air prices are subject to change based on airline policies and prices are not final until time of purchase. Machu Picchu train tickets and entry fees are set by the Peruvian government and are subject to changes and surcharges without notice. A deposit of $250 reserves your space now and is completely refundable up to 120 days before the trip. Balance is due 120 days prior to trip departure. This trip requires a minimum of eight travelers. Next: I'm ready to go - take me to the reservations desk!